Pull a chair and come sit with me. There’s cake and there’s coffee. I made mamon [mah-mon], the dearly loved sponge cake from Goldilocks, the dearly loved bakery back home. So stay. It’s been a while since my last post, I know. The demands of the days have been a bit overwhelming. If only the days were longer. More hours to do more, to write more. But all is good. I shouldn’t really complain. Life has been good. There’s so much to be thankful for. I’ve been spending a lot of my quiet time with my mom lately. On the road and at home. With Dennis and the corgis. Without the usual distractions. It’s actually refreshing to lose myself while tending to the garden and working around the yard, while cooking and baking. Without tweets and without posts. Without photographs. I feel completely engaged but relaxed, completely lost in a book, in a meal, in a conversation. Bear with me if you don’t hear from me often. I trust our friendship is such that we can and we will always, easily pick up where we left off, as if time’s never lost. Generously brush paper molds with butter and set aside. I make mamon in paper molds but metal ones and ramekins can be used instead. Sift cake flour, baking powder, and 1/3 cup sugar together into a bowl and set aside. Combine egg yolks, water, and butter in the bowl of a standard mixer fitted with the paddle attachment. Mix at low speed until well blended. With the mixer running, slowly add the dry ingredients and continue mixing for three minutes or until well blended. Scrape down the sides and bottom of the bowl with a rubber spatula. Set aside. Combine egg whites and cream of tartar in the bowl of a standard mixer fitted with the whisk attachment. Beat at high speed until egg whites double in volume. With the mixer running, slowly and steadily add 1/2 cup sugar. Continue beating until medium peaks form. Medium peaks hold their shape fairly well but the tip of the peak curls back onto itself when the whisk is lifted. Gently and swiftly fold in the egg yolk mixture into the egg whites. Divide the batter evenly among the molds. Bake for 15 to 18 minutes or until a toothpick inserted into the center comes out clean. Place the molds on a cooling rack for ten minutes. Remove from the molds and allow cakes to cool completely on the rack. 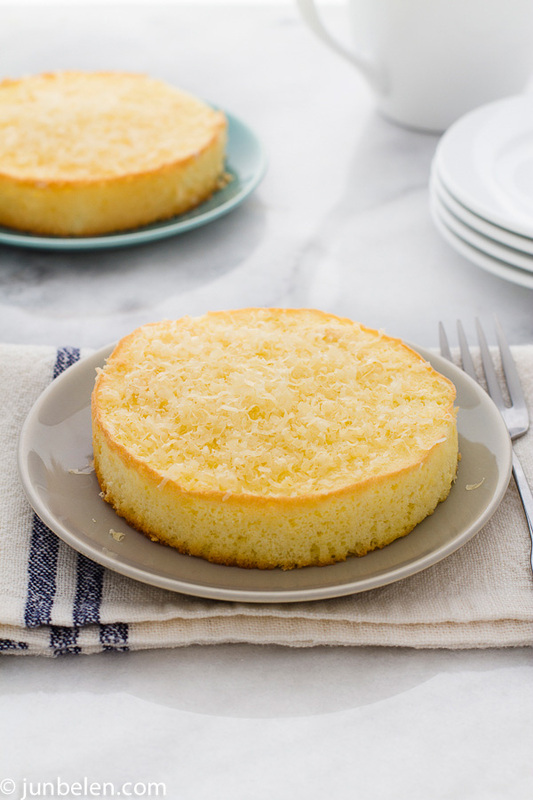 Brush cakes with butter and sprinkle with sugar and grated cheese. So happy to see your post this morning, Jun! I am glad you are spending quality time with your Mom, and Dennis and the Corgis. We all need more time to “unplug” and relax and just enjoy our surroundings. I would love to win the paper molds and then bake the Mamon! My email address is pupulebarbi@yahoo.com. Hope I win! Thanks, Jun! I’d love to get one of those molds! https://www.facebook.com/m.cris.rivera I LOVE your blog!! I hope I get lucky…:) Salamat!! Mamon is one of those foods with which I have no shame- I can just eat one slice after another…after all- it’s sponge cake! Half air really! Very glad to hear that life is well and your enjoying your time with your mom. Domestic bliss is underrated. Thanks for the terrific recipe. Now I won’t have to trek over to the Peninsula to get my fix of mamon. Cheers Jun! Sure. I would love for you to try the recipe. Oooh, mamonnnnn! I love Goldilocks, and their mamon is always what I pick out first when I go! I would love to try this recipe! My email is yay.mira@gmail.com – I hope I win! Ha! She will be delighted to read this! Thank you, Pru. Hmmm…thanks fir the awesome post. Here’s my email armstrongmae@gmail.com. I love your reading your posts! I’m a white girl who is learning to cook Filipino food for my Filipino girlfriend. The first Filipino food she had me try was at Goldilocks and the mamon was yummy. I would love to try this recipe in the paper molds. My email is showell01@msn.com. Thanks! Melts-in-the-mouth mamon with hot cocoa sounds heavenly! I can eat a dozen! Just in time for Thanksgiving. 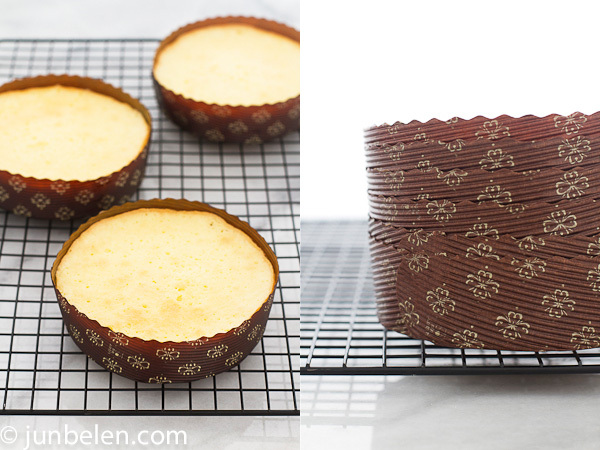 Thank you for sharing this mamon recipe , The paper baking cups look pretty too. I just love the way you write and am so happy to have found your blog. The recipes are a bonus. It would be fun to make these for my Filipino BIL – the paper cups would be put to good use. My email, and FB page, are attached to my commenting profile. Enjoy your time away from the camera. I left mine at home purposely the other night to reconnect with old friends. It was so nice to leave the blog at home. It’s Jun from Jun-blog! You’ve won the mamon paper molds from Sur La Table. Send me your mailing address and they’ll be on their way soon. Thank you so much for following the blog. Thanks junbelen, Filipino really loves mamon, specially children..You have a great recipe..I am a food lover, too. Yippy! I’m going to be making this soon! Thanks for the recipe! And you’re awesome for having corgi-kids. I have a corgi-kid, too.